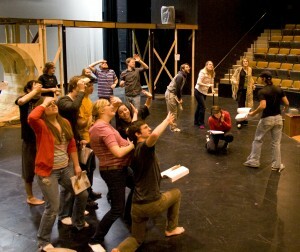 Gustavus students rehearse a recent play in Anderson Theatre. The Guthrie Theater in Minneapolis and Gustavus Adolphus College in St. Peter have announced that they are partnering to offer a unique and intensive summer Theater Audition Boot Camp, June 24-30, 2012. Aimed at bridging the gap between high school and college for students who are serious about pursuing a career in theater performance, the camp will allow students the opportunity to work on audition techniques and monologues with master teachers and artists from both the Guthrie Theater and Gustavus’ Department of Theatre and Dance. The weeklong camp will be directed by MacCarthy and will take place at Gustavus in a variety of state-of-the-art facilities including a 280-seat thrust stage, a black box, two dance studios, and several classrooms. The daily schedule will include classes in ballet, movement, voice, acting, and script analysis, as well as one-on-one coaching sessions. On Thursday, June 28, students will spend the day at the Guthrie Theater where they will have the opportunity to work with various Guthrie artists, tour the facilities, and learn about the workings of a major theatre organization. Students will take part in several 80-minute teaching sessions that will address various topics including “Intro to Stage Combat,” “How to Handle Shakespearean Text,” and “How Improvisation Skills Can Enhance Your Audition.” The day will conclude with students and staff attending the production of Roman Holiday in the McGuire Proscenium Theater. Supervised room and board is included throughout the duration of the camp. Students will be housed in dormitory style bedrooms in the College’s residence halls, which include wi-fi internet access, laundry facilities, and common lounge areas. Students will also receive three meals per day at Gustavus’ Marketplace, which has repeatedly been ranked by the Princeton Review as one of the top ten college cafeterias in the country. The Theater Audition Boot Camp is open to students going into grades 10-12. Tuition for the week is $1,200. For more information, including how to register for the camp, go online to gustavus.edu/camps/theatre or call 507-933-7486.